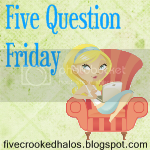 Here are this week's 5 questions - answer them on your own blog and link up at five crooked halos (click the button above) or just pick one and answer it in my comments section so that I can learn more about you!! 1. Do you open presents on Christmas Eve or Christmas Day? 2. What is your favorite Christmas cookie (or candy)? 3. What's the worst Christmas gift you've ever received? 4. Christmas song that you love? 5. How many trees do you put up?